Buying the Lamy 27 – which happened to have a medium oblique nib – made me fall in love with this kind of streamlined design from the sixties and the oblique that it was equipped with. An stubbish/italic kind of oblique that at the time was a part the regular range of most (German, at least) pen manufacturers with pride and self respect. 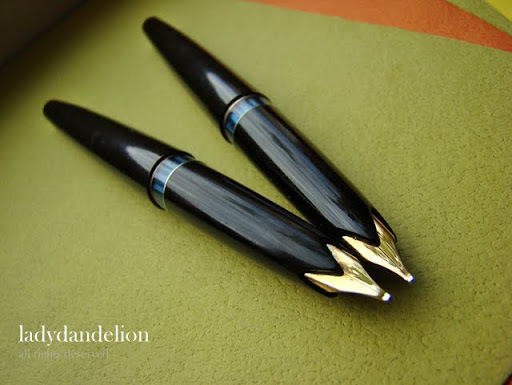 This buy made me crave for more and this search opened my eyes for the Montblanc 22 – a lot because of its original and beautiful semi-hooded nib. As bleubug kindly pointed out in a reply to the first post about these pens, the 22 was designed by Albrecht von Goertz – a man who also designed the BMW 507 – a beautiful sportscar and a special grand piano to celebrate the 125 year anniversary of the iconic piano maker Steinway & Son’s factory in Hamburg. A man with many talents who – in the MB 22 managed to unite the classic features of Montblanc with a modern shape. Even if the Lamy 27 – which is a pen that is also original – and the MB 22 share the basic characteristics they are both two unique pens. The Lamy 27 has its rounded rocket windows and the MB 22 has its special nib design (which it also shares with the more upmarket Meisterstück version n0 12 & 14). That is that about the design – at least for now. By sheer luck I managed to buy a couple of MB 22 for bargain prices. The nib sizes weren’t listed, but I thought that for such a good price as I got them for I’d be happy if they worked and had an OK nib. Both worked and both sported Oblique/stubby nibs. One of them is definitely a medium or broad oblique and one might be a regular broad that performs like a stub or a very diminutive oblique. The nibs wrote excellent right out of the box (OK I had to clean them, but no other measures were necessary) which is more than one can say of many new, modern pens. And all three nibs are made of 14 k gold and it is clear that they are made to write with – everyday writing. Since they are rather narrow obliques they suit very well for fast note taking without digging into the paper and they bring character and (I hope) some refinement and control to my scribblings when I take notes. These are pens built to be used, but also with a lot of thought put into the design – of both the pen bodies and the nib. Broad range of nib choices and semi-hooded to make it possible to put the pen aside for a moment without it drying out. These nibs – the broad range of nibs that were offered when fountain pens were still made to be used as tools also – once again – highlight the question why current manufacturers (some already know what will come now…sorry) do not offer more than F/M/B nibs in most cases – not even on pens in the higher price levels. The British manufacturer Conway Stewart has taken this a bit further with their recent Coronet series, which is their “entrance level”/budget pen with a price around £220/$300 if you buy it from an internet dealer. They only offer this pen with a medium nib without any option to send it in for a change. This for a pen that carries a price tag that, even if CS consider it a budget pen, still makes the pen belong to the expensive/luxury division. Imagine BMW or Audi doing the same with motor alternatives on one of their “cheap” cars. One dealer has been able to cut a deal with CS and offer it with their full range of nibs for a limited time – that is good, but not enough. I like many of CS classic designs, but find it very parsimonious and ungenerous to offer a pen at that price level with only one nib option – especially when it is a company that carry three sizes of italics. Very ungenerous in fact. I can understand why the Pelikano Jrs are made with one kind of nib – they are cheap (well made) pen for children who is learning to write. To apply the same policy on a high end product is…not so clever. The big hope when it comes to nibs is the Italian pen companies where particularly Stipula and Aurora offers a broad range of nibs for most of their (standard) pens. Of course one can always send the pen to a nibmeister for customization, but when I buy a new pen I don’t want to send it off to get the nib as I want it. I think all the pen manufacturers who consider themselves as manufacturers of writing tools should consider to widen their horizons a little and see the potential in broadening the nib ranges and market fountain pens as the individualistic alternative to plain ballpoints and roller balls. Why buy a fountain pen if it comes with the same narrow options when it comes to the tip/nib width and character as a ballpoint or a roller ball? This entry was posted in fountain pens, lamy, montblanc, pens, photo, writing and tagged 1960s, aurora, bmw, conway stewart, design, fountain pens, functionalism, germany, lamy, modernism, montblanc, pens, photo, steinway, stipula, von Goertz, writing. Bookmark the permalink. While I also lament the lack of choice with factory nibs, it is understandable. Here is one factor to consider: because handwriting has changed so much, and people are not taught correct penmanship and the light pressure needed to write, most manufacturers will never make exotic nibs because the vast majority of the buying populace do not know how to use them correctly. Imagine Joe Bloggs thinking a OBB or XXF looks like a great choice – he can easily afford it, he gets it home, presses too hard, holds it at the wrong angle, clogs up the tines, misaligns the tines etc… then takes the pen back, complains, and demands that it be fixed. Imagine the overhead involved for manufacturers to repair nibs that should never have been damaged – it is clearly the fault of the user, not the maker, but users expect the maker to fix it if they have paid enough for the pen. The maker can’t jeopardize their reputation by denying repairs based on user error. So, the maker eliminates the whole problem by offering easy and simple F/M/B nibs only. Thanks for adding an interesting perspective, Phtalo. I agree with you on the profit thing, but I do think it is a bit short sighted (not by you – the pen industry) if that is how the pen industry thinks. I also believe that it in the long run would profit more for more various options – especially in the expensive ranges. My frustration was recently spiked by Conway Stewart’s Coronet series. I really like the design and think it could be one of their new classics. But I find it rather arrogant that a pen company that consider them selves as a luxury pen manufacturer – doesn’t even offer F/M/B for a pen that cost around £220/$300 (internet retailer & plus shipping costs) – only M nibs without any option to change. To recruit new fountain pen buyers/users I believe that the companies ought to start flirting with the big group of people (many women) who enjoy scrapbooking and calligraphics and point out that (high end) fountain pens offer both beauty (the pen) and multiple nib choices. That is a neglected consumer segment that I think could be potential buyers of fountain pens in all price ranges. A big thank you to everyone for taking the time to write your opinions on the nib range issue. Good to know that I’m not the only one who think it is rather poor of the pen manufacturing industry (where fountain pens more or less are considered as luxury goods) to offer such a narrow range of nib choices. I think it is laziness/unawareness rather than costs associated with it. I can understand if the dealers choose to have the most common nib sizes in stock and have the more unusual for special ordering, but it can’t be that expensive to offer a broader range of nibs. I, too, love oblique, stub, and italic nibs in a range of widths. I am really vexed when, on a very expensive, luxury pen, I can only buy a Medium, Fine, or Broad nib. I know I can send it to be cutomized, but I don’t think I should have to. If I am spending upwards of £150 on a pen, it is a luxury pen, and there should be a full range of quality nibs available from manufacturers without spending another £30 or so having the nib reground to one’s own specification. I much prefer my handwriting with oblique, stub, and italic nibs. By the way, I love your pens, and your handwriting. It may be that there is a cost issue involved as to why certain pen manufacturers are only providing a limited number or in some cases only one choice of nib for their fountain pen ranges. If this is the case I agree that it is very short sighted by these manufacturers. After all most Premium Brands reputation is built on levels of customer satisfaction & service that their competitors wishfully aspire to. By limiting the choice of nibs available to their customers this must have some affect on their brands reputation? It’s frustrating, I agree. I don’t want to buy something and then immediately send it away – I want to use it. Good choice on the MB – I’ve been thinking of buying one of that vintage myself. I like the brushed-finish 220 they did. I’m happy that vintage pens are available with nice nib choices and are more easily obtainable than ever. But I am sad that it’s hard to get new pens with fun nibs like stubs and obliques. If you take the time to use a fountain pen with all its inherent quirks I would think you’d also want to have many options for what kind of line it puts onto paper. Sure there are some companies that supply a choice of nibs still but they are often on expensive pens and carry a premium. Custom nibs can be ground but that’s another expense. Oh, I do sound very picky now. 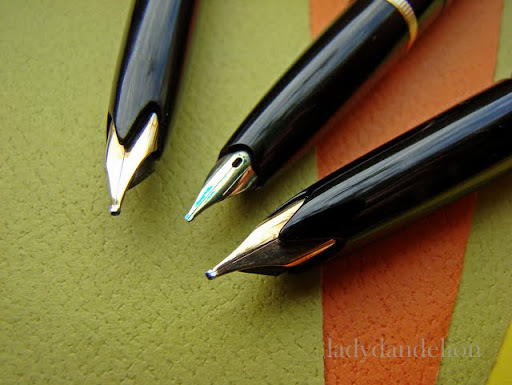 The Montblanc models of this line (22 etc.) always looked very nice to me since they have just the right amount of modernism. The successor line called “Classic” kept this shape through the 70s but the hood lost the little “point” over the nib. In fact the recent “Generations” line of writing instruments is heavily indebted to these predecessors. I guess that makes this shape timeless. 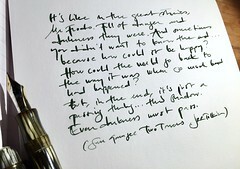 This was a great post and it raised an issue that’s close to the hearts of us rather freaky fountain pen users. Loved the writing samples too! Thanks. Love your writing and totally agree on the nib options issue. Fountain pen users are hardly a “one size fits all” bunch. Few will buy a new pen just to send it off for six months to a nibmeister for a grind the pen should have had in the first place. You’ve found a good solution but it just shouldn’t be necessary. Hey, pen manufacturers! Anyone listening?